DEPOSIT: A non-refundable deposit of £50 a week is required. The balance is payable 28 days before start of your holiday . Please settle your balance when due as no reminder will be sent. Prices are inclusive of heating, bedding and towels. The living accommodation consists of a large lounge/dining area, TV/DVD, Freesat, Gas fire for chilly nights with plenty of books and games for rainy days. Also a pull out bed. Please ask for extra bedding on booking. 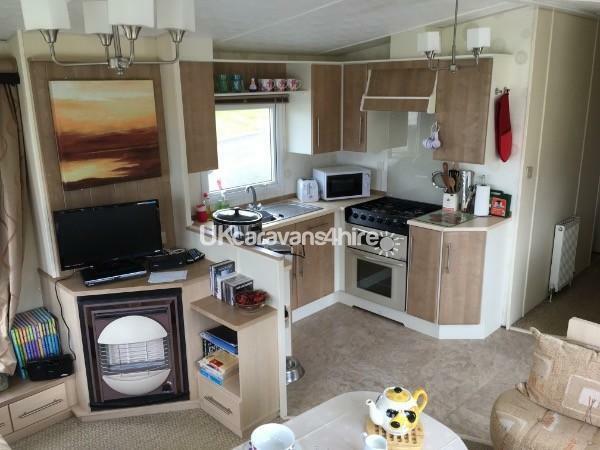 The kitchen is fully fitted with a Gas cooker, Microwave, Toaster, Fridge with small freezer compartment, cooking utensils etc. 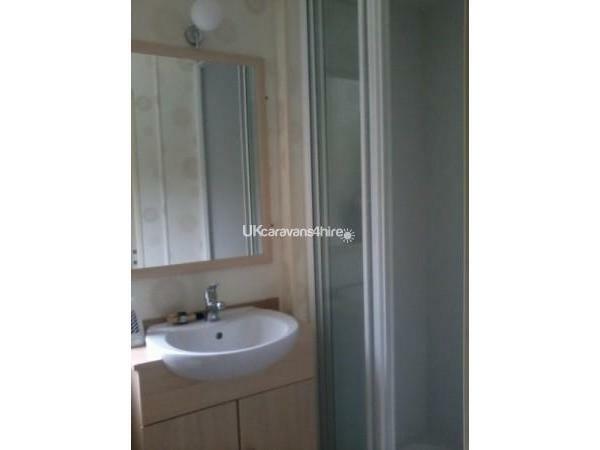 The Bathroom has a low level WC, Washbasin and shower. 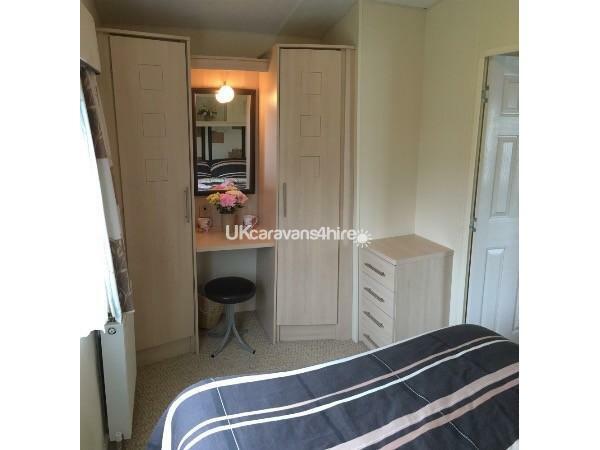 The twin bedroom has 1 wardrobe, over bed storage space, mirror dressing table and draws. There is double glazing and gas central heating, radiators in all rooms. 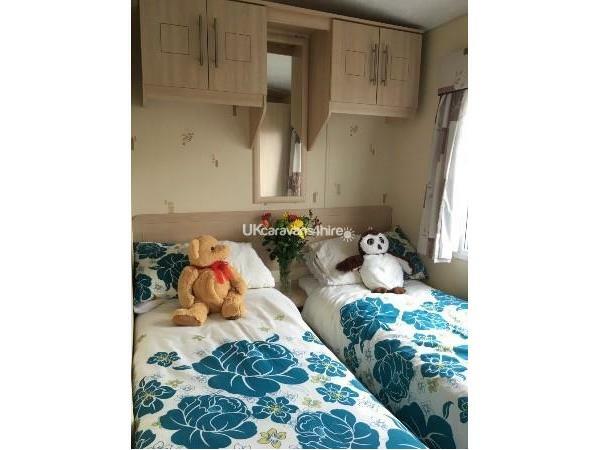 Duvets, Pillows, Sheets, towels and Pillow cases are provided..
OUTSIDE: There is a decking area with chairs and a table, and a lawn area on which to play Parking is for one car outside the caravan but there is plenty elsewhere on site. Well behaved dogs are allowed. Dog towels, doggie bags brushes, combs, shampoo and tick removers are provided as well as longer than average leads for those walks around tthe site also covers for the furniture.there is also a first aid box for animals and also for humans provided. 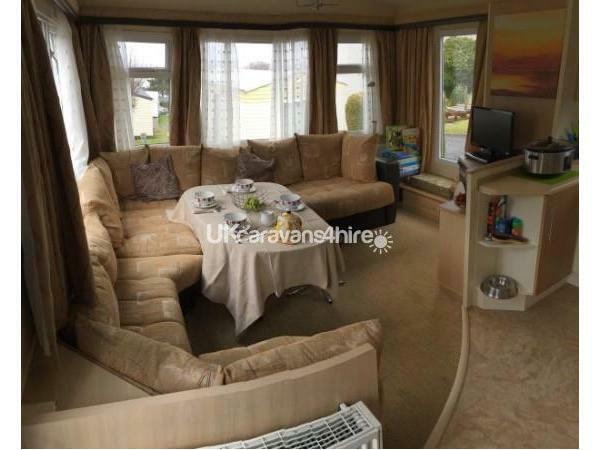 A welcome hamper with bread, milk, biscuits etc will be in the caravan upon your arrival. 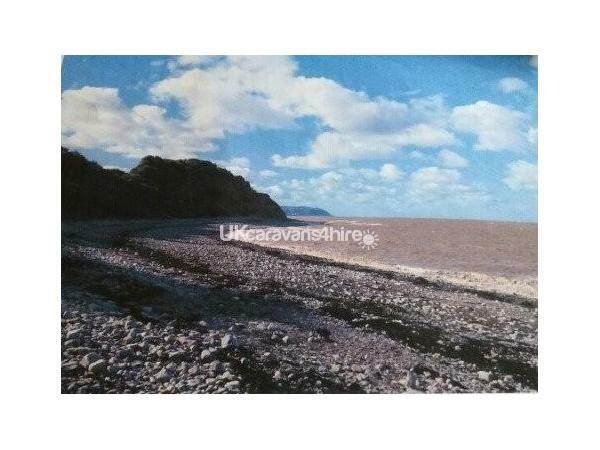 The site is within a few minutes drive from the ancient Harbour town of Watchet, also Blue Anchor where one can fish from the shore, The Exmoor National Park with its ponies, Dunster Castle and Minehead. There are many places to walk, maps and information in the information pack. Sorry no stag/hen parties etc. Additional Info: Swimming pool (open during the season). Children's play area. 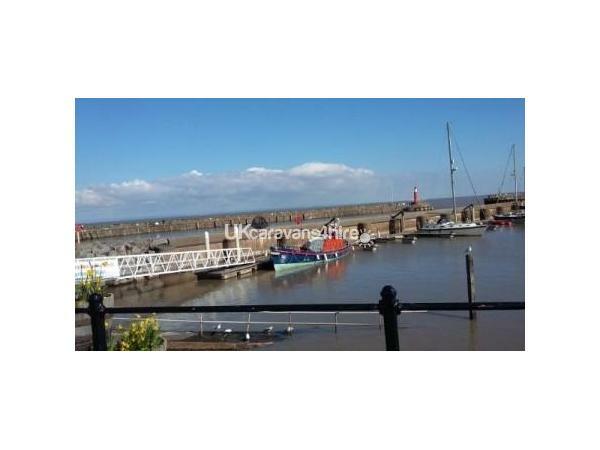 Laundry, shop and access to private beach. We had a lovely weekend away, and the caravan was just perfect, a real home from home with a welcome pack of fruit, muffins, tea, coffee, milk, everything you need to settle in.We will be back again, thank you. We’ve just come home from a week staying in ‘Liliput’ (caravan’s name) and a little sad to leave. It was so nice. Pat was there to greet us and show us around. The welcome hamper was a lovely surprise, cakes, chocolate eggs, full fruit bowl, bread, marg and milk in the fridge. Tea and a jar of nice coffee and cupboard full of condiments, crackers etc. These ladies have thought of everything you would need and for the first few days I kept discovering more, full sewing kit, great pair binoculars to look across the Bristol Channel to Wales. Plenty of things for rainy days. 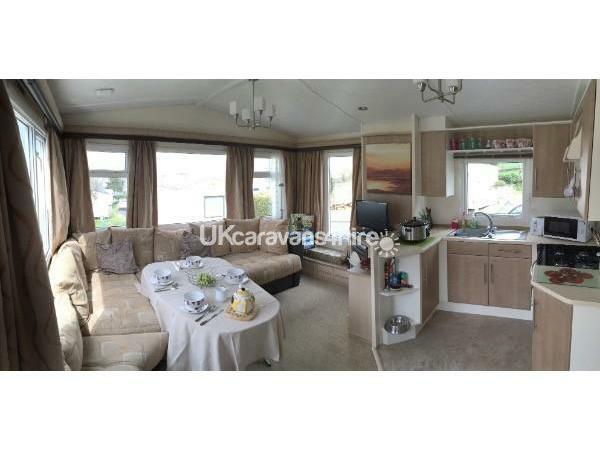 The caravan was very clean. A bale of fresh clean towels for everyone. Bedding clean and fresh, beds comfy, lights all worked. Bathroom had a good shower, toilet and sink all very clean. 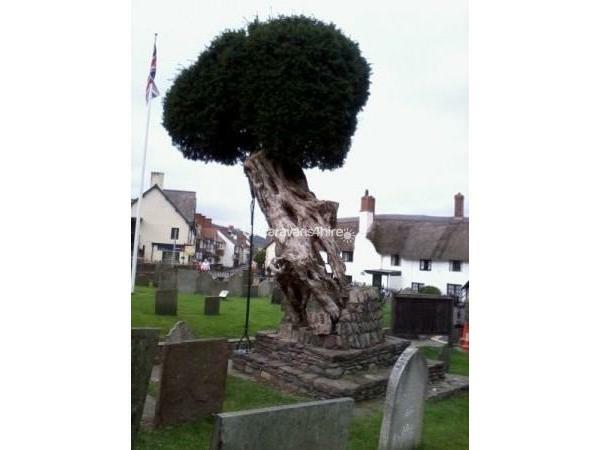 It has a good size decking area with table and chairs and a beautiful little garden with bench under the tree. The site itself is very calm (no noisy clubhouse) neighbours and everyone we met were very friendly. Pat & Lynn are on the site and are available should you need them. I will have no hesitation in returning. My 11 yr old had a brilliant time the fossil beach was amazing. The park has a shop which is not overpriced. The heating in the caravan was great and easy to control. So glad we have found it. 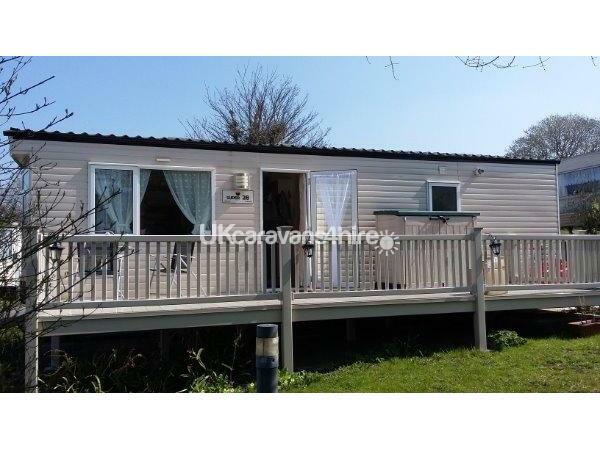 WE HAD THE OPPORTUNITY TO STAY IN THIS LOVELY CARAVAN OVER THE EASTER WEEKEND . WE BEING MYSELF AND MY 4 SONS AGED 5 TO 12 . THE CARAVAN IS VERY CLEAN AND FULLY EQUIPPED . IT FELT LIKE A REAL HOME FROM HOME , THE OWNERS HAVE CATERED FOR EVERYONES NEEDS. THE SLEEPING ARRANGEMENTS ARE EXCELLENT AND WE HAD NO PROBLEM BEDDING DOWN FOR THE NIGHT EVEN WITH THE IMPENDING STORM. 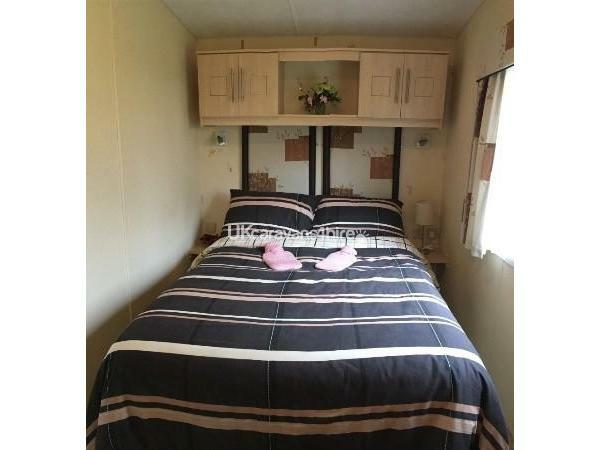 IT HAS FULL CENTRAL HEATING AND THE FULL SIZE SHOWER WAS A WELCOME CHANGE .THE OWNERS COULD NOT HAVE BEEN MORE HELPFUL REGARDING SITE INFORMATION ,BOOKING WAS PAINLESS ,THEY EVEN LAID ON AN EASTER EGG HUNT FOR THE CHILDREN . 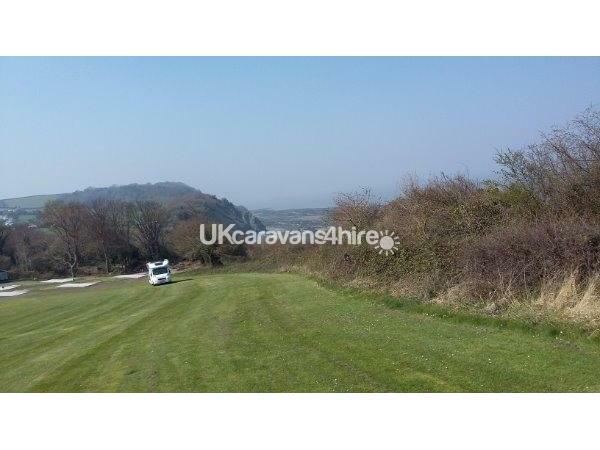 I WILL DEFINATELY BOOK THIS CARAVAN AGAIN AS WE THOROUGHLY ENJOYED IT . THANKYOU FOR A LOVELY STAY .